Michael Dourson, President Trump's pick to lead the U.S. EPA Office of Chemical Safety and Pollution Prevention, is already working at the agency, E&E News has confirmed. "Dr. Dourson's title is adviser to the administrator," an EPA spokesman said yesterday evening. Shortly after EPA acknowledged the former environmental health professor's role, the Senate Environment and Public Works Committee announced it was indefinitely postponing votes scheduled for this morning on Dourson and other nominees. A spokesman for Chairman John Barrasso (R-Wyo.) declined to comment on the reason for the delay. But there were concerns about whether at least one of the candidates would get enough votes (see related story). Dourson's previously unannounced position at the agency is troubling to watchdogs. "Until he is confirmed, he shouldn't be working there," said Meredith McGehee, chief of policy, programs and strategy at Issue One, an ethics advocacy group. McGehee said the ethics pledges Dourson agreed to abide by as assistant administrator of chemical safety and pollution prevention don't apply until, and unless, he gets that job. One promise Dourson made is to not participate in "any particular matter" involving the North American Flame Retardant Alliance, a component of the chemical industry's top lobby group, the American Chemistry Council, which paid him $10,000 last year (E&E News PM, Sept. 15). "With political appointees, there is an oath to take or a paper to sign," McGehee said. "And until that moment, they do not have the same obligations and they should not have the same responsibilities." Dourson isn't the first Trump EPA nominee to advise Administrator Scott Pruitt without full Senate approval. Susan Bodine, his choice for assistant administrator of enforcement and compliance assurance, began working at the agency last month as special counsel to the administrator on compliance. But unlike Dourson, who has encountered fierce opposition from Democrats and environmental groups for his ties to industry, Bodine had already been cleared by the committee and was widely expected to be confirmed (Greenwire, Sept. 14). The reason Bodine's enforcement chief bid is stalled is largely because Senate Democrats have refused to back any EPA nominees until Pruitt is more responsive to the minority party's oversight requests. Republicans, led by Barrasso, have slammed that reasoning as an excuse for short-staffing the agency's leadership ranks (Greenwire, Oct. 4). EPA said Dourson was advising Pruitt after E&E News began raising questions about his role at the University of Cincinnati. An email sent Monday to Dourson's university email address produced a "delivery failure" notice. Then yesterday — after the university received a records request from E&E News about Dourson's employment status — his staff biography on the College of Medicine website disappeared. 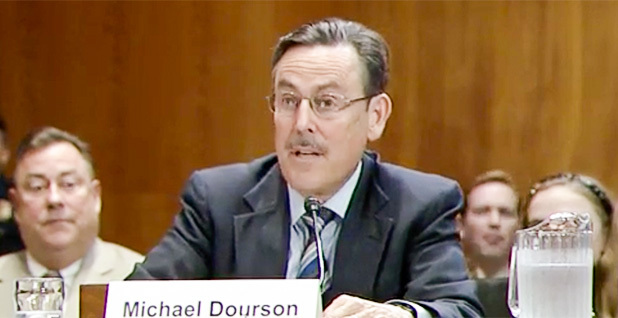 It previously noted that Dourson "is a board-certified toxicologist with an international reputation for excellence in environmental risk assessment." In brief phone calls, two of Dourson's former university colleagues said he had left the school. They declined to offer further details and referred questions to the university press office. E&E News then confirmed Dourson had an EPA email address. Other administrations, including President Obama's, have hired nominees as advisers as they wait for Senate confirmation, a process that can take months or years.